California Governor Gavin Newsom has not wasted time wading into the healthcare debate. The governor has proposed an individual mandate requiring all California residents to obtain health coverage or face a penalty, and having California become the first state in the nation to offer subsidies to individuals and families with income between 400% and 600% of the federal poverty level. Currently, only individuals and families with income between 100% and 400% are eligible for government subsidies for purchasing health insurance through Healthcare.gov or a state-exchange. Other proposals include creating the largest-scale single-purchaser system for prescription drugs and the expansion for Medi-Cal to cover undocumented young adults. California’s push for a statewide individual mandate may be further proof that 2019 could be the year for more state-based individual mandates. Currently, Massachusetts and New Jersey have state individual mandates in place. Vermont will institute an individual mandate in 2020. These actions at the state level have been prompted by Congress’s decision, as part of the Tax Cuts and Jobs Act of 2017, to lower the tax penalty to $0 for any American that does not purchase health insurance as required by the ACA’s Individual Mandate. The $0 penalty goes into effect this year. The Individual Mandate penalty is still in force for the 2018 tax year. Recently, the U.S. District Court for the Northern District of Texas, Fort Worth Division, made a controversial ruling that because the Individual Mandate was zeroed out, it had the effect of rendering the ACA unconstitutional. The ACA remains in effect while the court ruling is being appealed. Expect more states to consider pursuing state-based individual mandates to help pay for their healthcare programs unless Congress moves to restore the penalty for the ACA’s Individual Mandate. As more states pass their own individual mandates, expect healthcare regulations to become more complicated and fragmented, adding new layers of complexity to what employers face in addressing compliance with the federal ACA. Under the ACA’s Employer Mandate, Applicable Large Employers (ALEs), organizations with 50 or more full-time employees and full-time equivalent employees, are required to offer Minimum Essential Coverage (MEC) to at least 95% of their full-time workforce (and their dependents) whereby such coverage meets Minimum Value (MV) and is Affordable for the employee or be subject to IRS 4980H penalties. If you are an ALE and have not yet filed ACA information with the IRS for previous tax years, be aware that the IRS has started to issue a new round of ACA penalties that focus on failure to distribute 1095-C forms to employees and to file 1094-C and 1095-C forms with the federal tax agency by required deadlines. These are penalties in addition to the 4980H penalties for not offering the required healthcare coverage. With half the businesses in the U.S. saying they are not confident in their ability to satisfy ACA requirements and reported 4980H penalties in the tens of millions of dollars, the stakes are high. Now is the time to get real about your organization’s obligation to comply with the ACA. 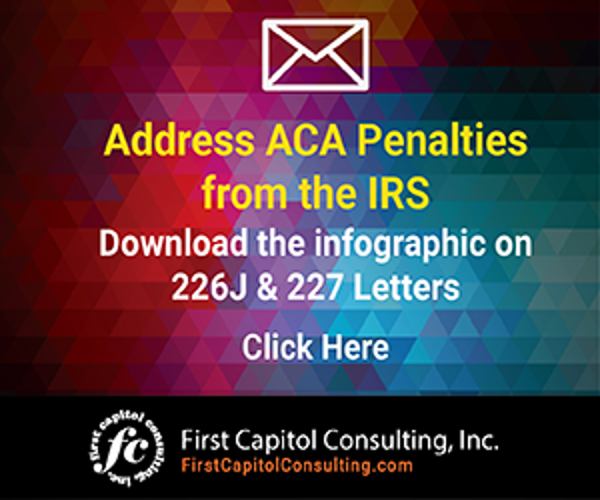 If you are a company that should be filing ACA-related information with the IRS and have not complied, you should immediately seek assistance to submit filings for the 2015, 2016 and 2017 tax years to mitigate your potential financial exposure. 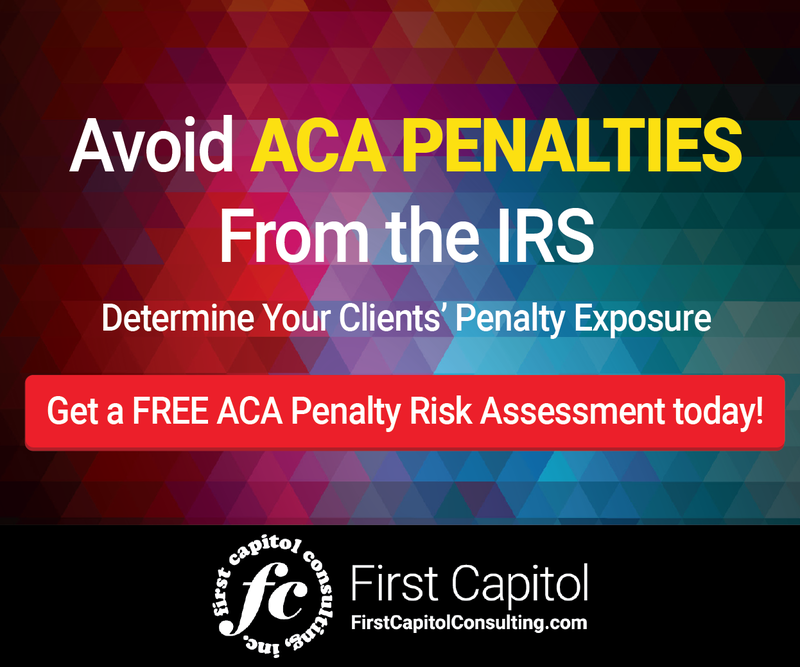 Organizations lacking confidence in their ACA process should consider undertaking an ACA Penalty Risk Assessment. Many outside experts who specialize in ACA services offer these assessments at no-cost. To learn more about ACA compliance for the 2018 tax year, click here. California’s proposal for a individual mandate may provide encouragement to more states to adopt their own.